With February nearly over, Black History Month will soon come to an end. There are some special activities you could still catch such as a special jazz performance in commemoration of the month on Thursday, February 27, 2014 from 6 to 7 p.m., presented by the New England Conservatory, at the Grove Hall Branch of the Boston Public Library in Dorchester. Admission is free. Or you could visit The House of the Seven Gables in Salem, which is presenting an exhibit about the Underground Railroad through February 28. It highlights the important role that Boston-area abolitionists played in helping slaves escape to freedom. Just because February is almost over, however, doesn&apos;t mean that you couldn&apos;t continue to explore African-American history in our fair city. For example, beginning March 17 and continuing through late November, the National Park Service will offer daily (Sunday excluded) ranger-guided tours of the Black Heritage Trail. The 90-minute tours are free and take visitors on a journey in the footsteps of important historical figures such as Frederick Douglas and William Lloyd Garrison. 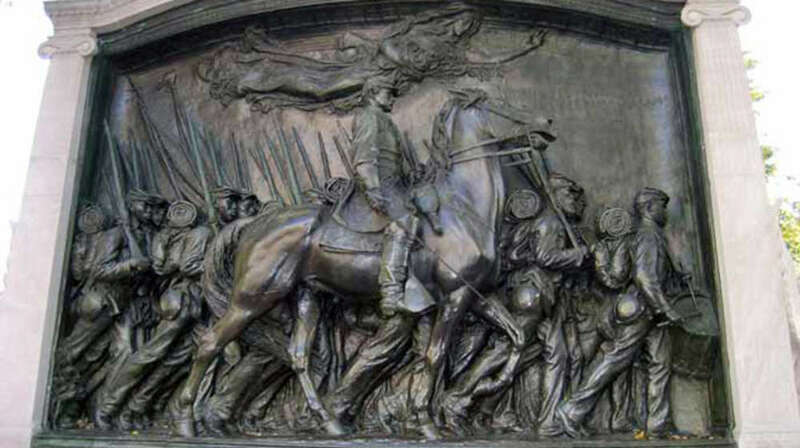 Stops include sites such as the Robert Gould Shaw Memorial and the Abiel Smith School. You could also visit the Museum of African American History on Beacon Hill. Located on the site of the African Meeting House, a National Historic Landmark, the museum showcases Boston&apos;s 19th-century African-American community. Through the end of March 2014, the museum is presenting "Freedom Rising," an exhibit celebrating the 150th anniversary of the Emancipation Proclamation. It also honors the first black troops from the North to serve in the Civil War, including Massachusetts&apos; 54th "Glory" Regiment. Photo: Robert Gould Shaw Memorial. National Park Service. Arthur Levine, who has been living in and enjoying the Boston area his whole life, is the HUBa HUBa blogger. He particularly takes pleasure in sharing his adventures and finds with others. He has written about his Boston and Massachusetts journeys for Boston.com, the Boston Herald, the Cape Cod Times, the Providence Journal, and other publications. Some of Arthur's favorite things to do around the city include checking out a new dining spot during Dine Out Boston, catching upcoming movies at the Boston Film Festival, going to Fenway Park (during the 2013 World Series championship year, he finally got to see the Red Sox win a game there), taking in a summer show at the Bank of America Pavilion or at the Hatch Shell, and listening in as native Bostonians jabber using their unique patois.